“Their only native home is the United States. FWS is passing a death sentence on an animal as American as the bald eagle.” ~ Rep. Raul M. Grijalva, Arizona, ranking Democrat on the House Natural Resources Committee, in The Washington Post. One of the rarest mammals on earth, the red wolf, is likely headed for extinction in the wild. The U.S. Fish and Wildlife Service has proposed a rule that would dramatically curtail the 30-year-old program to reintroduce the critically endangered red wolf in North Carolina by allowing the wolves to be killed if they wander off federal property. North Carolina officials and many landowners in the area have vehemently opposed the wolf’s reintroduction there. They won’t be kind to wandering wolves. “Like all wolves, red wolves are predators of mostly small game, and they naturally stray from boundaries drawn by humans,” the article states. The U.S. wildlife agency says it intends to manage a small pool of 10 to 15 wolves at the refuge to maintain their gene pool while they search for a safer place on our millions of acres of published land for them to survive. However, most of our public land is hunted, trapped and defiled with lead shot. This dramatic failure of the Endangered Species Act is only one of 90 Republican attacks on the Endangered Species Act. Ramona Magee is a staff attorney for the Southern Poverty Law Center who successfully filed for an injunction to stop issuing licenses to landowners to kill red wolves two years ago. “We’re very frustrated that the agency has continued to ignore the will of the American people on the red wolf issue. In 2016 conservation groups worked together to deliver a petition with half a million names calling on the U.S. Fish and Wildlife Service to do more to save the red wolf,” Sutherland told the Post. Wolves have been shot, run over, trapped and removed by federal officials for behaving like wolves and roaming to find new territory. They have mated with coyotes to try to survive. He added that it is a political maneuver because coyote hunters find the wolf inconvenient to their other killing. Red wolf kills would not even have to be reported unless they are wearing a radio collar (which can easily be buried). 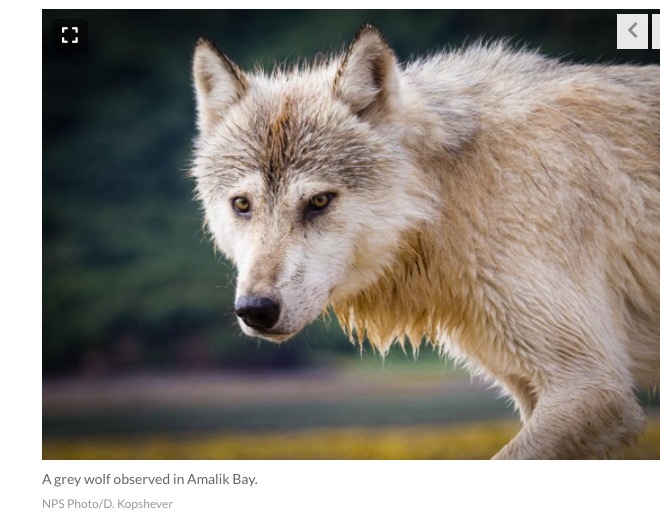 Katmai National Park in Alaska has a website about the wolf wars: “The wolf’s greatest downfall has been the fact that it relies on the same food sources as modern humans,” it reads. “North America was once home to as many as 57 million hoofed animals — bison, antelope, deer, elk, and bighorn sheep — today less than 8% of that number exist, mostly composed of deer. As European settlers moved through the continent, the American grasslands were extirpated of big game and replaced by sprawling farmlands.” And livestock. Given the extreme loss of their natural prey, in an attempt to survive wolves that encounter livestock kill surprisingly few. Of course wolves do not know livestock is “owned” by humans only for their consumption. Farmers dominate the livestock landscape and hunters take wolves’ natural prey. Are humans the only species allowed to eat on this planet? Humans created the imbalances that are devastating our wild creatures. “The widespread view of the wolf as an evil, revolting creature has resulted in the destruction of thousands of wolves and often brutal torture of the animal. The luckier recipients of man’s wrath were poisoned or shot. Others were burned alive or scalped; some had their mouths wired shut or their eyes scorched by branding irons, then were released back into the woods to slowly starve to death,” the Katmia National Park website reads. “The Fish and Wildlife Service isn’t just neglecting its duties, it’s actively undermining its own role as the protector of our nation’s endangered species,” Rep. Raúl M. Grijalva, of Arizona, the ranking Democrat on the House Natural Resources Committee, told the Washington Post reporter, in reference to the red wolf proposal. 1. Red wolves: Go to this website. Put into the search box “North Carolina red wolves” and Endangered and Threatened Species: Nonessential Experimental Population of Red Wolves in Northeastern North Carolina should top the list. You will see a lot of deceptive blather and the green Comment Now tab in the top right hand corner. Comment period ends July 30. 2. Hunting and Trapping in National Preserves: Alaska, proposed rule, which would eliminate these current prohibitions: “Taking any black bear, including cubs and sows with cubs, with artificial light at den sites; harvesting brown bears over bait; taking wolves and coyotes (including pups) during the denning season (between May 1 and August 9); taking swimming caribou; taking caribou from motorboats under power; taking black bears over bait; and using dogs to hunt black bears” Go to this website. It should take you directly to the Comment Now tab. Comment period ends July 23. This column was originally published in the Madison CapTimes on July 15, 2018.